We are delighted to welcome Maryann Jacobsen, a registered dietitian and co-author of Fearless Feeding How to Raise Healthy Eaters from High Chair to High School to the blog. Feeding kids in today’s world isn’t easy. Not only do parents have a lot of pressure to raise healthy kids, they don’t always get the support they need to make it a reality. That is, until now. 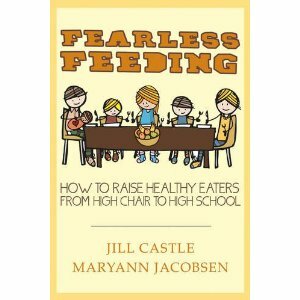 My book, Fearless Feeding: How to Raise Healthy Eaters from High Chair to High School,by Jill Castle and Maryann Jacobsen, fully supports parents in their important job as feeder. The book demonstrates that common feeding mistakes aren’t a result of flawed parenting, but missing feeding knowledge. Once parents have a bigger picture of what is going on with feeding, it is pretty easy (even empowering!) to turn things around. 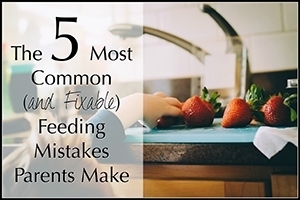 Let’s look at the five most common feeding mistakes and simple fixes you can make to raise fearless eaters. Feeding Mistake #1: Interfere with Eating: Whether it’s two more bites, not allowing seconds or insisting on a child eating one food in order to get dessert, research suggests that about 85% of parents try to control their child’s food intake at mealtime. This is especially true with children small or big, with parents more likely to pressure the thin child to eat more, and the larger child to eat less. Why it’s a mistake? Children are born with the natural ability to regulate their food intake. When parents try to get children to eat less or more, for example, they teach children not to trust their body, which can hinder self-regulation. And research shows that pressuring to eat results in less food intake while cutting a child off at mealtime increases the likelihood they will eat in the absence of hunger (think sneaking and eating more when able). The Fix: Most major health organizations like the American Academy of Pediatrics recommend the Satter Division of Responsibility of feeding. That means parents decide the what, when and where of feeding and children decide the how much and whether of eating. This not only helps children self-regulate and build confidence in their eating, it makes mealtime more peaceful and supportive, so children can move along food acceptance at their own pace. Feeding Mistake #2: No Structure: Suzie tells her mom she’s hungry and her mom says “of course you can eat” so she goes to get a granola bar. This same things happens when she wants juice, milk and any other food. She often eats in the car, while watching TV and while playing at the park. There is no rhythm or structure to eating and the child is calling the shots on when and what she is eating. Why it’s a mistake? Suzie isn’t learning to eat out of hunger, she’s learning to eat out of habit. She never really understands what hunger means but she knows that gets her yummy food when she wants it. She often eats little at mealtime or large amounts because she is so hungry. The result is poor food regulation and increased sensitivity to environmental cues of eating. The Fix: Structure meals and snacks at predictable times and in a designated places like the kitchen table. Young toddlers need to eat about every 2 to 3 hours, preschoolers every 3 to 4 hours and older children about every 4 hours or so. When children want to leave after eating very little, remind them when the next meal is (Make sure you got enough to eat because we aren’t eating until X) and when they want to eat between meals remind them when the next meal is (I know you want a snack but we are eating in an hour from now). Feeding Mistake #3: Short-order Cooking: In their family of four, eight-year old Sam was the one who would often refuse the family dinner. His mom worried about him going to bed hungry so she made him an alternative meal if he didn’t eat the mealtime choice. Why it’s a mistake? Children learn to eat a variety of food at different paces and Sam was a slow learner. Sam’s mom’s actions were telling him she didn’t believe he could expand his food repertoire which inadvertently decreased his eating confidence. The Fix: Sam’s mom needed to adopt an expectant attitude with food, letting her son know that she believed he could start eating more things. This starts with making one dinner meal, asking for input when meal planning and offering one or two items at meals that are likely to be accepted. It also helps to switch from plating meals to family style and allowing children to serve themselves. Parents can fill in nutrition gaps at snacks and other meals, giving children time to branch out at dinner on their own. Feeding Mistake #4: Pushing Veggies: When talking to parents, concerns about low veggie intake are the norm. Many go to great lengths to get vegetables into their children because they are afraid their child is missing out on important nutrients. Why it’s a mistake? One of the reasons veggies are often shunned is that about 70% of young children are sensitive to the bitter compounds in them, something that decreases over time. When parent push (or force) veggies, children may become averse to them, instead of gradually learning to like them had there been no pressure. The Fix: Children don’t have to eat vegetables to meet their nutritional needs if they eat a variety of fruit and other foods. That being said, parents can offer vegetables often and in a variety of ways (no sneaking) such as raw with dip, make-your-own salads, and in yummy smoothies while modeling their consumption without the pressure that turns kids off. Feeding Mistake #5: Fixing What Isn’t Broken: Without knowing what to expect at different stages of development, many parents assume that certain food-related behaviors are problematic and may respond inappropriately– babies that refuse puree, picky eating in toddlerhood, wanting to eat what their friends eat at school age and dieting in the teen years. Why it’s a mistake? All of these food-related behaviors are a normal part of child development. Parents don’t need to “fix” the behavior but instead they need to work with their child to allow the best outcome. The Fix: Being prepared for each stage helps parents see what’s coming and not take it personally. Most babies are physically ready to self-feed anywhere from 6 to 10 months, so give them the opportunity with age-appropriate food. After age two, growth slows so most toddlers don’t need as much food as parents think, so keep meals pleasant and allow them to pick and choose from what you offer. Your school age child wants to belong, so allow it to happen with food in sensible ways. And despite how they act, teens still need their parents so ask questions when you see odd food behavior and be there as a guide and role model. With the right information and support, parents can become fearless feeders raising children who grow up to be fearless eaters. Maryann Jacobsen is a registered dietitian, mom of two, freelance writer and co-author of Fearless Feeding: How to Raise Healthy Eaters from High Chair to High School by Castle, Jill, Jacobsen, Maryann (2013) Paperback . She is founding editor of Raise Healthy Eaters, a popular blog about family nutrition. She also blogs regularly at WebMD’s Real Life Nutrition and is a featured nutrition expert for WebMD Answers. She also co-founded the Fearless Feeding Movement on Facebook to provide parents with the support they need.